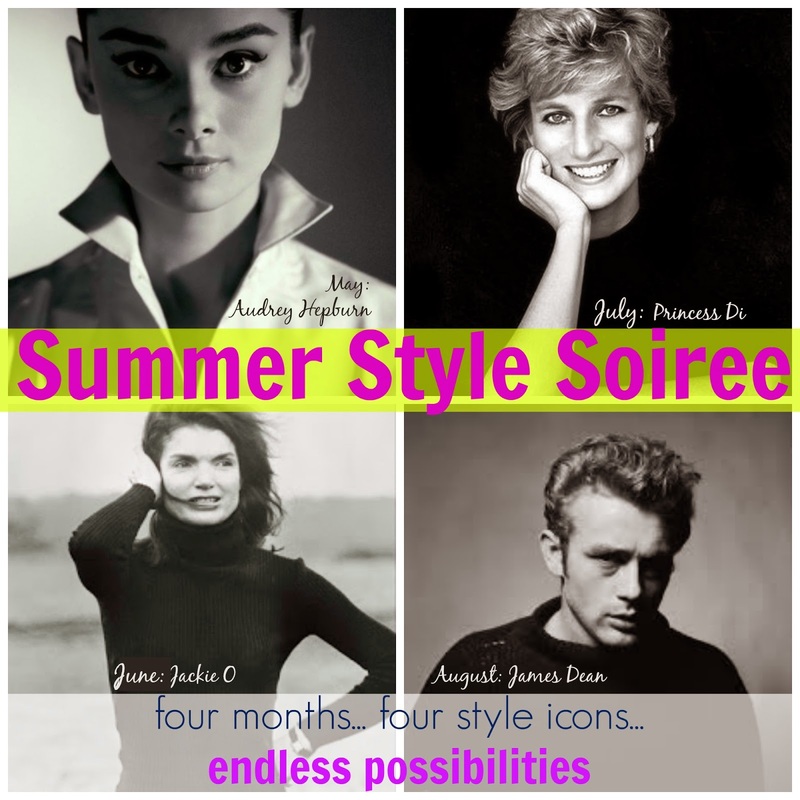 It's so hard to believe, but it's already time for this year's final Summer Style Soiree project! Today, our inspiration is none other than the iconic James Dean. To me, when I hear his name I automatically think... movie star, Hollywood, fame, glamour, and of course, a leather jacket. Waaaay back in the Spring, I threw out a little dilemma and asked for suggestions from you guys, and you came through with some great ideas! 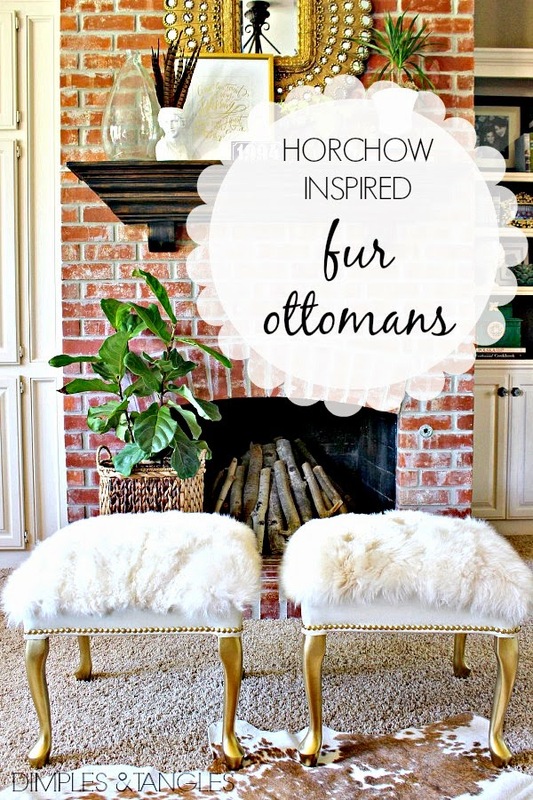 As a refresher or reminder, the topic of discussion was the ottomans that I've had for several years, and had covered with faux fur way back when. It's been time to replace the now-matted down fur and I wanted to use a thrifted fur coat that I've had on hand. I had enough to cover the tops, but couldn't figure out what to do with the sides. When I put out the call for ideas, a dear friend sent me these benches that she had seen at Horchow, and I knew it was the perfect solution! 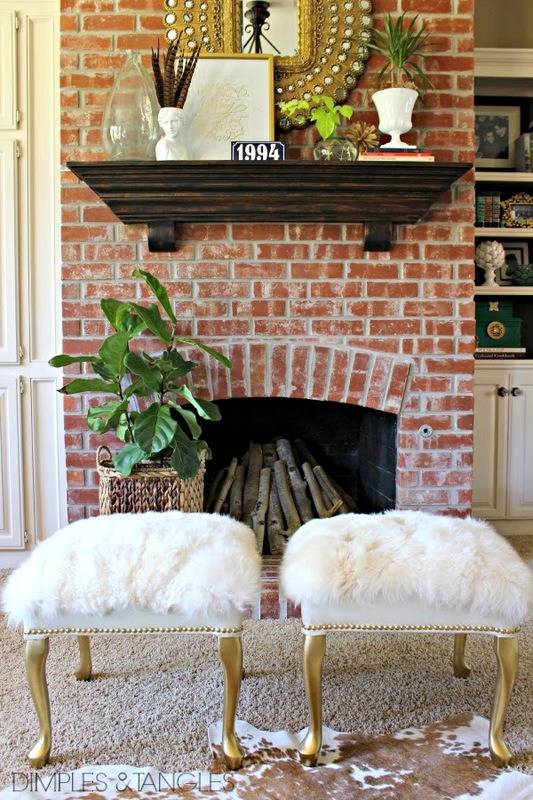 So, when I thought about this month's project, James Dean + furry glam furniture + a bit of "leather" somehow naturally went together for me, and I knew these ottomans would fit the bill! After stripping off the black fur, I gave the legs a fresh coat of gold spray paint. For the sides, I measured and cut strips of leather-looking vinyl to wrap the sides. Mine were about 9" tall, and I was able to cut two long strips and piece them together, so there were only seams on two of the corners. Then, I trimmed around the leg leaving a 1/2" margin or so, then tucked that under to give a finished look. I wrapped the side piece between the legs to the under side and hot glued it to the liner underneath. On the top side of the vinyl strips, I just trimmed the corners so it would lay flat, and glued it down. None of this would show so I wasn't too particular with it. My fur coat was taken apart into the largest pieces possible, so I had the back, sleeves, and two front pieces to work with. I laid them out like a puzzle on the stools to get the best coverage with what I had. It worked out surprisingly well! I used some extra pieces to patch odd empty spots here and there. When everything fit together, I hot glued the edges of the fur down to secure everything. Finally, I added the nail head trim. It was very helpful to drill a small pilot hole for the nail head tacks. Without it, I was having trouble getting the tacks in straight without bending them. This was definitely a designer "look for less" project! I think I paid about $10 each for the stools, I used a yard of imitation leather (vinyl-$5 from Hancocks), had the nailhead trim on hand but it would have been around $10, and the $12 for the coat was money well spent. By piecing it together I had just enough for both stools. I removed the collar and pom pom tie and have used them around the house in other places, last Fall here and Christmas here. I didn't have the pretty acrylic legs, but I like my price much better than Horchow's $1889 (for one) price tag! I was so used to the black fur that I'm having to adjust to the lighter color, but I think it's a nice change. Be sure to come back tomorrow! All of my co-hosts will have their James Dean inspired projects posted, and the Link Party will be live at 7 a.m. EST. If you missed my other Style Soiree projects this summer, you can catch up on them here! i loved them before, but now- oh my even better!!!! love love love the nailheads. Oh I think they look great. So fresh and glam. And I love how the nailhead trim just pops. Isn't it funny how stepping away from a project helps the perfect idea come to mind?! I love this new version- just the perfect mix of neutral/glam/rustic! 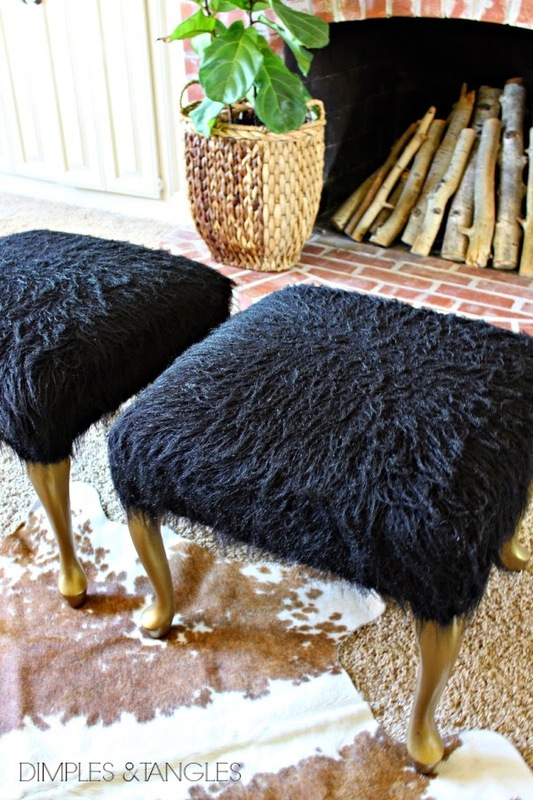 I love these little stools, and the fur is fabulous. The white is so nice for a change and the nailheads totally finished the project. Looks fabulous. Oooh, I LOVE them!! The perfect glam addition to your room, and they look so high-end! Jennifer, these are gorgeous! I love the fur. I have a fur coat stashed away for a project like this one day. They look so great! These turned out fabulous! WOW! Love the mix of the leather and fur! Fabulous! I can only imagine how good they must feel. If your husband is anything like mine, he will be rubbing his face on them soon. These turned out SO gorgeous! 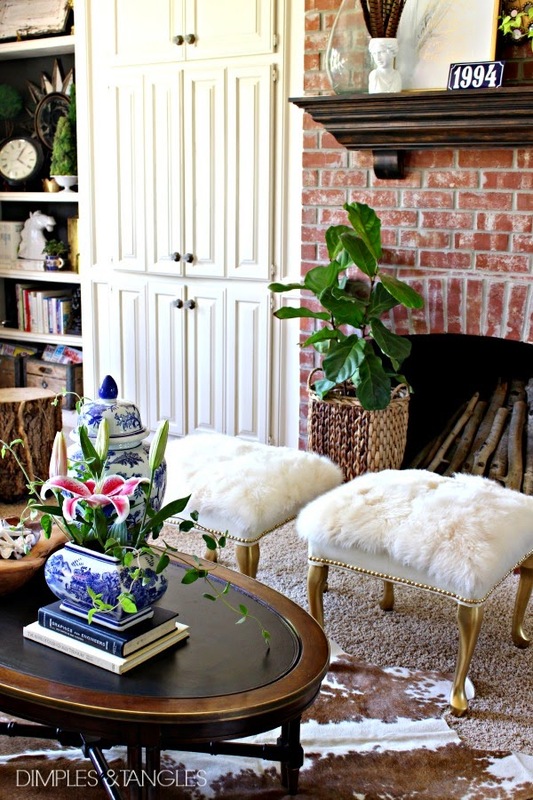 White fur + white leather + GOLD!! And $10 each. I'm dying. So, this is totally, inadequate, but..."good job." Love these. They are so fancy and look great against the rustic look of the brick wall behind them. So fun. Absolutely gorgeous Jennifer! They are gorgeous! Well nailhead trim looks a whole lot easier to do than I imagined! The new stools are gorgeous! Your stools are fabulous, Jennifer! 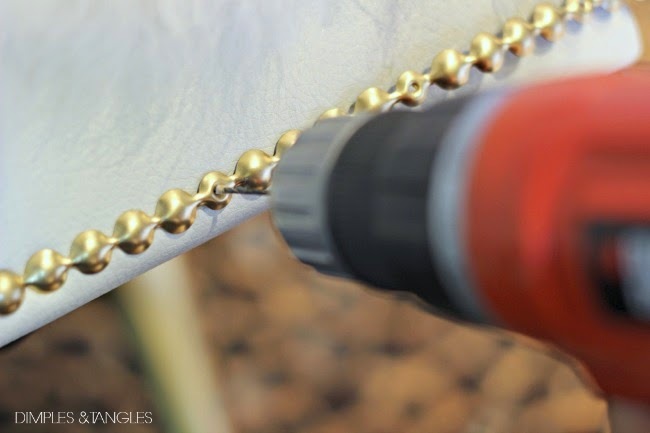 Love the nailhead trim that you added. What a great idea! So clever Jennifer! I can't believe you hot glued all of that! I LOVE these, Jennifer! 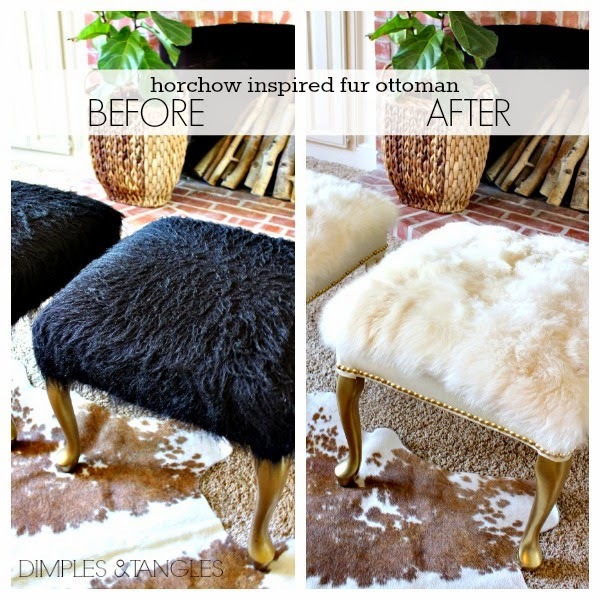 I have been dying to top an ottoman with some white fur, but I don't have a good ottoman for it yet! I am so jealous over your white fur coat - awesome find! Jennifer, these are stunning! Thanks for sharing, def inspired! Wow girl - so pretty! Why didn't I save my fur coat??? I love this - I think it is time to go thrifting!!! These are so fun and so "you"! Absolutely FAB my friend! Love love love them. These look so good Jennifer! 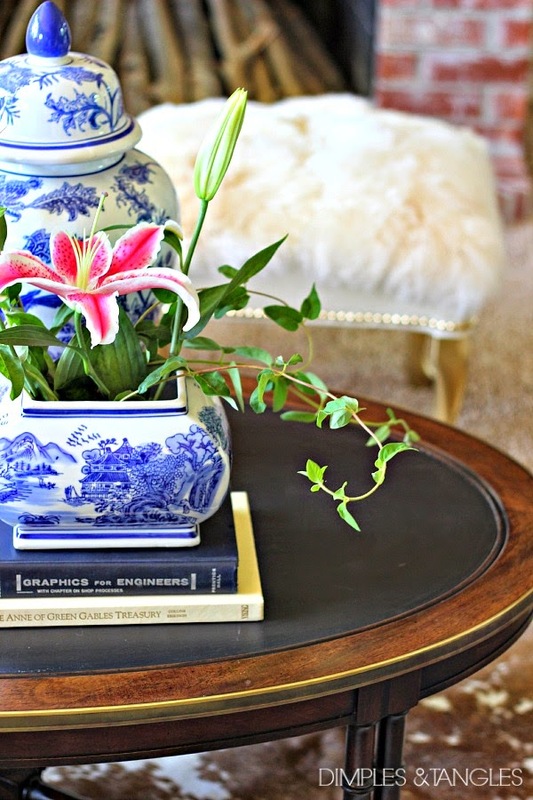 You would never guess they were done on a thrifty budget! I love them. What a great style! I love makeovers inspired by expensive designer pieces. These look like a million bucks! Great job. Thank you!!! 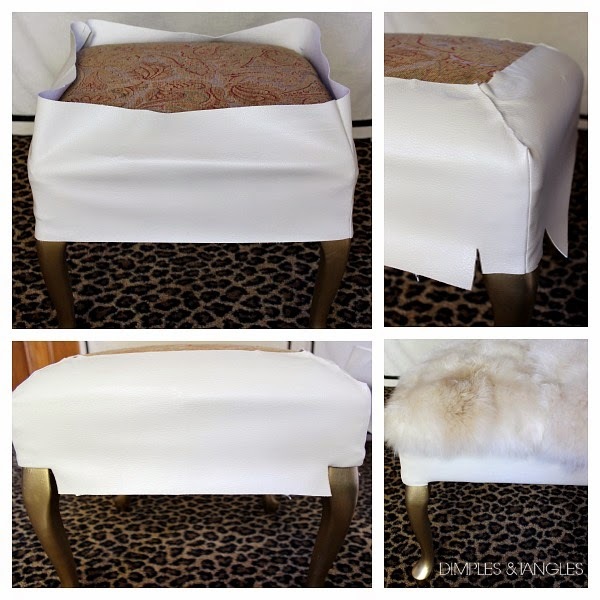 I have plans to do the same thing - my MIL's old fur stole and a needs updating vanity stool. My fur is not big enough either. Now I can move forward. A trip to fabric store today.